Ultra compact device allows a person to make a fine controlled descent from high level. heightec’s MICRON evacuation system is a high specification compact self evacuation system at a fraction of the size and weight of traditional systems. 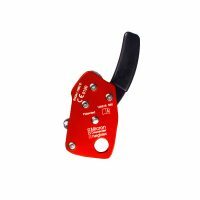 This system allows a person to make a controlled descent from high level using the MICRON descender device which has a unique patented DuoBrake mechanism, for fine control of descent speed. Can also be used to off-weight and lower a casualty. Locks if handle is released or squeezed too hard. The MICRON Evacuation System gives double action safety and fine control using pre-loaded, high strength, heat resistant Aramid cord. The 100% Aramid construction of MICRON cord gives increased performance at high temperatures over Aramid mixes. (Non-Aramid components melt sooner, leaving the cord with reduced strength). Pre-threaded, complete with attachment karabiners and prompt sheet. Packed and sealed in durable storage bag. Potential use by anyone who works at height, but perfect for the onshore and offshore wind industry. 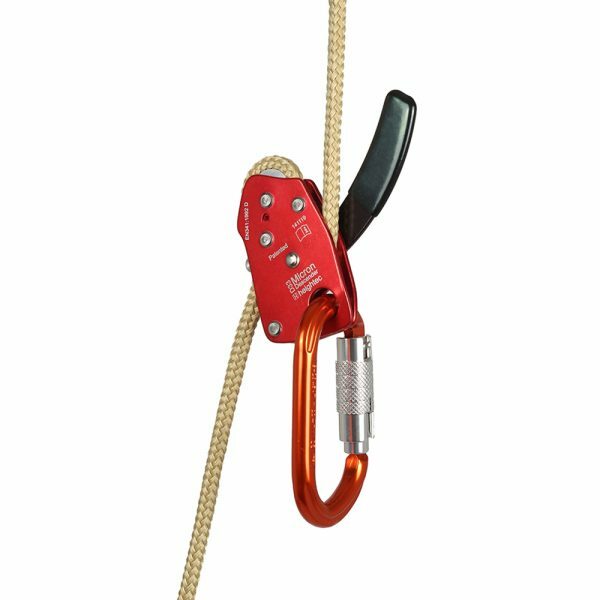 The MICRON’s compact small size (equivalent to 10 mm karabiner) provides full size functionality, is lightweight and easy to carry on the harness as part of the full evacuation system. Karabiner can be clipped directly into eye bolts. Descent cord has additional loop for passing through pad eyes or around small section steel work. Cord can be choked around large beams etc. The MICRON system offers all the functionality of larger systems at a fraction of the size. Aramid cord is high in strength and heat resistant. Weighs 0.8 kg for standard 15 m kit. NB: Storage bag varies depending on rope length. D33100 supplied in KARI 5. D33120 supplied in KARI 15. Lengths available: 15m, 30m, 50m, 100m, & 120m. For bespoke lengths please contact us. Patented GB 2 367 048.